A 14-story building under construction in a Denver suburb collapsed Thursday, seriously injuring four workers, a fire department spokesman said. Ten others suffered minor injuries. 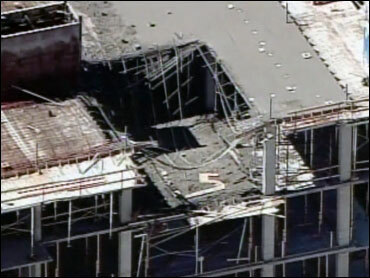 Officers say construction workers were pouring concrete on the 13th floor of the building when the floor collapsed, reports CBS' Denver affiliate KCNC. Everyone at the site has been accounted for, said West Metro Fire spokesman Howard Hardy. But rescue teams and engineers were going through the building to make sure no one else was caught in the collapse. The building is located in the Tech Center, located along Interstate 25 in the southern section of the Denver metro area.